Pisidia included the mountainous country between Phrygia and the north of Pamphylia and north-east of Lycia. Uncivilized in early times, only Selge struck money before the time of Alexander the Great. After Alexander died, the region was ruled by Antigonus Monophthalmus, and possibly Lysimachus of Thrace, after which Seleucus I took control. The Seleukids founded colonies at strategically important places and the local people were Hellenised, but the area was contested by the Attalids of Pergamon and invading Galatian Celts. In 39 BC Mark Antony bestowed Pisidia upon Amyntas, king of Galatia, who held it until his death in 25 BC. 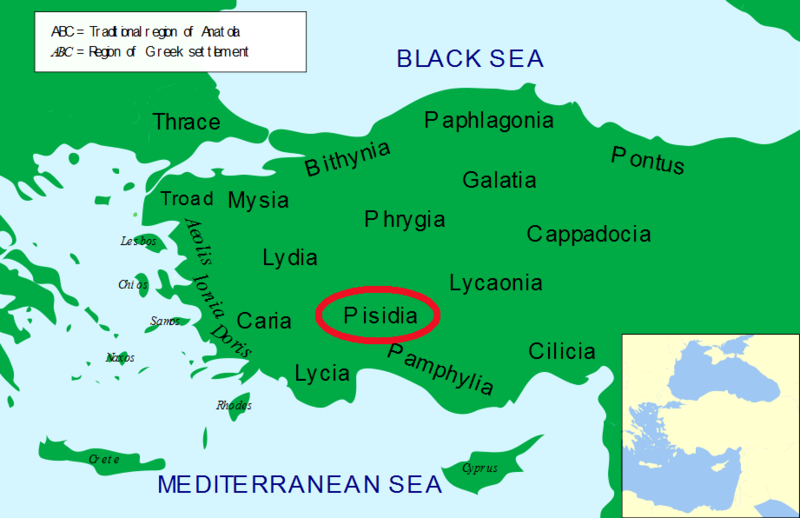 Pisidia was then made part of the new province of Galatia.